Paris is removing the love locks from the Pont des Arts bridge. 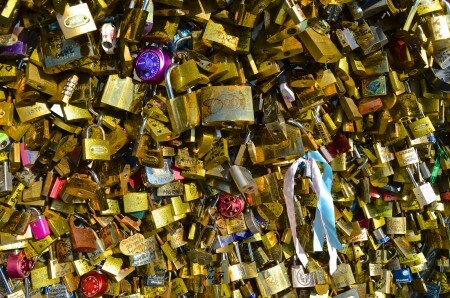 For years couples have attached little padlocks to the bridge as a symbol of their love. Newlyweds or newly engaged couples travel from all over the world and one reason for their visit is to attach a lock to the bridge. But the bridge is collapsing under the weight of hundreds of thousands of locks. The city stepped in and and said “no more”. I’ve written about this phenomenon before. Sharing experiences, traditions and superstitions are very powerful motivators. People throw coins in fountains, rub statues and kiss rocks for all kinds of reasons, all over the world. These traditions can be very powerful drivers for tourism, how strange this might sound. Travel often lacks a sense of urgency. You can visit most destinations any time in your life. Paris will still be Paris ten years from now. Mona Lisa will still be the same and so will the Eiffel Tower. But with a tradition tied to a life event such as engagement or marriage, the emotional connection acts as a catalyst. Paris is putting a halt to it. I understand the safety concerns but here’s what I don’t get. They are taking away a strong motivator for travel. Why not give people an alternative? A new place to place a lock. It would be so simple. Hire an artist to create a sculpture with the purpose of attaching locks. Build it in a way you can remove locks from time to time. The coins from the Trevi fountain in Rome are also collected at night. I can guarantee that without an alternative, people will just move on to the next bridge, or not show up at all. By William Bakker | 12.04.14 | Permalink | Comment? I have the privilege of attending our SoMeT conferences on three different continents. The learning is incredible. Both from the speaker content, and also from speaking to the attendees. It helps me a lot in my work. A question I get asked a lot is if there are differences between DMOs in different parts of the world, their challenges and their approaches to solving them. The answer is: yes and no. The challenges are very similar but the approaches differ. I think the regional differences are partly cultural but also influenced by the “neighbour effect.” People pay close attention to the DMO next door, and then this is reflected in their own strategies and tactics. For this reason, it’s interesting to attend a SoMeT conference on a different continent. You’ll see a different spotlight shone on familiar challenges. It can be very eye opening, and will inspire you to try new ideas and approaches. I know it does for me. Not to mention the fact you’ll also make new connections with your international peers. It might be a tough sell to your boss or board. The optics and psychological barrier of an intercontinental flight (and costs) to go to a conference when there are options closer by is challenging. But when you put it in terms of value, the additional cost are minimal compared to the value it delivers. We’re talking a few hundred dollars. So keep an eye on our conferences around the world and what they have to offer. #SoMeT15EU will be held in Amsterdam. 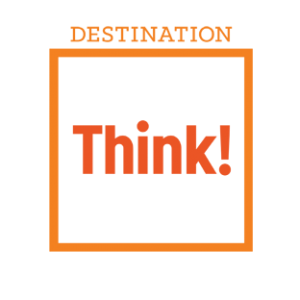 I’ve worked at a destination marketing organization for 11 years, and have spent the last 4 years at Think! 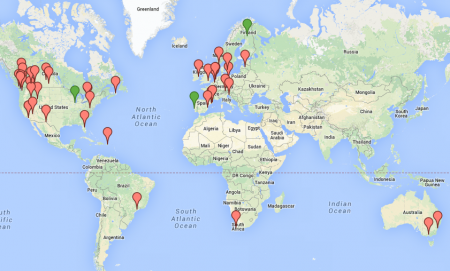 where I’ve worked with more than 100 DMOs from all around the world. And a big challenge for every DMO is managing their industry stakeholders. The politics. Proving value and relevancy. Even if well-intended, I don’t think industry stakeholders truly understand how their actions can impact the efficiency and effectiveness of their DMO. You might compete with other businesses in your destination, but the reality is that when more people want to visit your destination, everybody benefits. That’s the marketing job of the DMO. To get more people there, get them to stay longer and spend more money. Your DMO needs to focus on the things that make your destination unique and the things that make people want to visit. 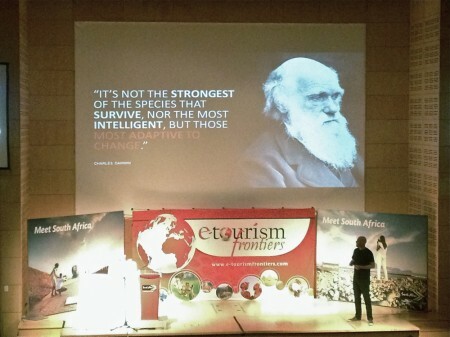 You might not like it, but some experiences/businesses are more important drivers for tourism than others. Don’t take the view that that big attraction doesn’t need additional exposure, because you’re completely missing the point. The Eiffel Tower makes people want to visit Paris, while the café down the street probably doesn’t. Tourism Paris needs to promote the Eiffel Tower, not the cafe, lovely as it might be. What you should do: let the DMO work by focussing on the things that will make business better for everybody, even if that means giving more exposure to certain products than others. With the exception of few cases, your DMO shouldn’t put their time and effort into selling things. It’s a waste of resources. Once someone makes the decision to visit, there are legions of other places where people can buy packages, flights, hotel rooms, etc. These organizations are much better at it than your DMO. Your DMO doesn’t need to do this. What you should do: Don’t see your DMO as a sales channel. Your DMO sells the destination experience, not tickets or reservations. As a tourism business, you worry about next month’s sales. And if they don’t look good, you might look at your DMO to try and fix it. In some cases, that’s valid (think the BP oil spill). But in most cases, it’s not. Your DMO should take a long-term view (especially your state/provincial/national DMO) to build your brand, reputation and demand for the long term. If they don’t, other destinations will win in the long run. What you should do: Let your DMO take a long-term view for the ongoing growth of tourism in your destination. DMOs are often publicly funded. That comes with specific complications. They’re under a lot of political and press scrutiny. If they make a “mistake”, it can be used by politicians in the opposition, or result in negative press. Both can have very bad impacts on funding. This situation can make things frustrating for you. 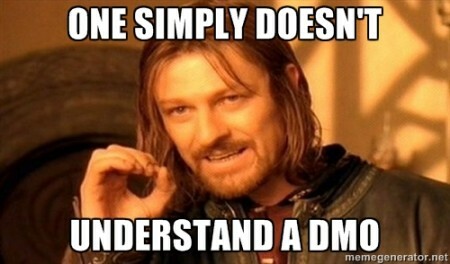 But guess what, your DMO people are often very frustrated by bureaucracy…they just won’t tell you that. I’ve worked at, spoken to and worked with hundreds of people working for these organizations and they’re almost always the most dedicated professionals who understand their responsibilities. They love where they live, what they do and want to make you successful. What you should do: Lose the scepticism, and learn to collaborate and support the staff of your DMO. They’re good people who need your support, especially when they’re impacted by politics and press. Because industry stakeholders pay so much attention to how things look, a DMO will often pay more attention to what their industry might think instead of what is most effective for the potential visitor. They’ll even ignore marketing such as Google Ads, email marketing or social media because they need the budget for TV or something. It’s often not because they want to, it’s because you make them, directly or indirectly. What you should so: Don’t judge your DMO’s marketing based on how it looks. Focus on objectives and results. Be open minded about where and how they market your destination. The world of marketing has changed. As a marketer you need to experiment in order find out what works and what doesn’t. There are too many DMOs out there afraid to do anything different or innovative because they’re afraid. Afraid that if it doesn’t work out, industry stakeholders, media or politicians will criticize the efforts, and their funding (or jobs) could be in jeopardy. As a result, DMOs are often very risk-averse, resort to being safe and old-fashioned, with mediocrity as a result. What you should do: accept failures as long as they’re used to make things better in the future. Also, defend your DMO from media and politicians when things don’t work as planned. Any other suggestions, or examples where your businesses have supported your DMO? Share them with me here! By William Bakker | 05.23.14 | Permalink | Comment? Here’s an exercise you should do. Then list what the reason is for that. If you can’t credibly get to the last answer, you need to seriously consider if what you’re doing makes sense. You should also really think about each step and evaluate of this is truly the case. Do the numbers indicate this? And what would the impact be if you wouldn’t do this? What would be the impact on the consumer? Is there an alternative for them? Are you doing some things because you’ve always done them? Or because you think your stakeholders demand it? Or because you need to outdo the DMO next door in some arbitrary number? 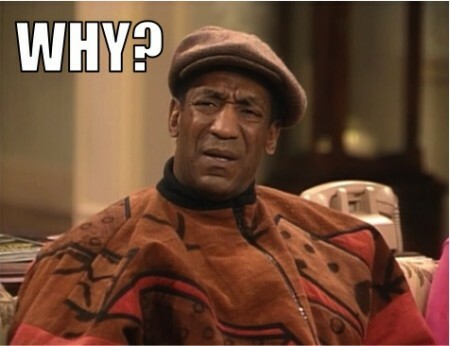 For example, what would happen if you didn’t run those PPC ads? Would people simply find the information elsewhere? Is that information elsewhere good if not better? Is the real reason for those ads because you need to report the number of website visitors? This is not attack on PPC campaigns by the way, they can be very effective. Someone needs to ask these questions, for everything, regularly. It’s part of being strategic. By William Bakker | 05.07.14 | Permalink | Comment? Last week Foursquare announced it is going to split its mobile application into two. One is focused on discovering new places and the other (Swarm) will be focused on helping users share their location with their friends. They join Dropbox, who unbundled photo storage in a separate app (Carousel), Facebook, who unbundled their chat functionality from their main app, and others. They also join other companies who offer apps such as HotelTonight and Uber who also focus on a single-use case. Most DMOs have “one-size-fits-all” websites and mobile apps that cover everything, for everybody. It’s easier to build and maintain one website, template and its content. I used to hate microsites when I worked at Tourism BC for that very reason. But as a result, DMO websites are often big beasts that are inflexible, hard and expensive to maintain after all. Things have changed. Technology is ambiguous. Content is incredibly fragmented and apps and services similarly specialized. Content is abundant. DMOs need to be storytellers. You’re still the experts in your destination. But instead of focusing on being the experts on what time a museum opens, be the expert on the context of your destination. You know: the culture, history and the people. Be the destination storyteller and add value. What if we unbundle our destination into very specific niches and build incredibly targeted apps or web experiences (mobile first) for our users? What if we put somebody in charge of these applications who is just as passionate about the niche as your visitors? What if it includes real-time information and social integration? For example: an app for foodies. Not just listings but the story of the restaurants including menus, profiles of the chefs, reviews from prominent bloggers (you hire to produce this content), information about local farmers and food from the destination, recommended itineraries, etc. An app that adds incredible value to the food experience. An app that tells the story of food in your destination before and during the trip. Another example: architecture. I’m a bit of a fan of architecture but by no means an expert. I love to wander a city and look at the and wonder about the style, history, etc. What about an app that explains all this? That shows photos of buildings the way they looked when they were build? Stories about their history. The architect. The style. Walking routes. Things that add value. Things that make the destination experience better. An app that would make me stay an extra day after a business meeting, just to wander around and learn. Or music! An app that tells you about the music scene. Interviews with bands and links to their tracks. The venues and their stories. Interviews with the owners. Real-time information about who’s playing where and why you might like them. Information about the scene around music. The record stores. The bars. An app that adds value to the destination experience. An app that gives you an instant feel for the scene before I go and an instant connection with it when I arrive. Some are venturing in: Visit Oostende has created a Marvin Gaye iPad app of a walking tour through Oostende. Marvin Gaye lived in this Belgian coastal town for about a year and wrote and recorded “Sexual Healing” there. The DMO created a wonderful experiences for Marvin Gaye fans, fans into music and soul, as well as people curious about this piece of it’s history. Do you need other examples? No. It’s not just about listings. It’s about context. Unbundle for niches, talk to visitors in a more meaningful way. I’ve spoken at dozens of conferences and attended dozens more. I’ve been to really good ones, I’ve been to bad ones and I’ve been to some where it was all about the money. We (at Think!) also run our SoMeT conference in the US, Australia and Europe. Find your peers: the best part of a conference is often the networking. Find conferences where you can connect or reconnect. I remember that from my DMO days. SoMeT, for example, offers more of a community and the conference also serves as a yearly reunion of friends. So ask around, see what your peers will be attending. No sales pitches: too many conferences sell presentations, and you’ll end up listening to sales pitches. 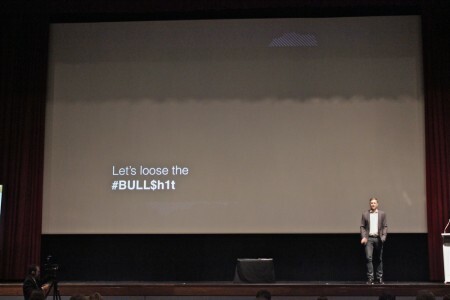 Avoid conferences where (too many) speakers are also sponsors. Look for DMO (or non-vendor) speakers: These people have nothing to sell to you. And case studies are typically the way to learn. The nice thing about our industry is that people share a lot of learning with each other. Find presenters you like, don’t look at the title of the presentation: Conference organizers will often make up titles without the presenters’ knowledge. Look for speakers you know and respect. Research the keynote speaker’s blog and see what they’ve posted on Slideshare. Avoid too many panels: Panels are hard to pull off. You need a good moderator and engaging panelists. It’s rare when it happens. People are too nice and polite. When I’m on a panel, I make a point of trying to stir things up for that very reason. Based on the guidelines above, I also design my presentations and avoid any direct sales pitches for Think! I share what I know and what I’ve learned – which is just what I like to see from a presenter. I always, always worry about giving people enough value, not the amount of business cards I collect. That’s also how we run our SoMeT conferences. We make sure there are plenty of networking opportunities, we don’t sell speaker slots, we invite tons of leading DMOs from around the world to speak and use panels sporadically. If I had one conference I could attend a year, I would attend a digital tourism conference that follow my rules above. If I could attend two, I would pick one outside the tourism industry on a specialized topic. So not SXSW for example. I would pick a conference specific to word-of-mouth marketing, social media, UX design, service design, gamification, content marketing, SEO/SEM, etc. Hope to see you out there soon. By William Bakker | 01.06.14 | Permalink | Comment? 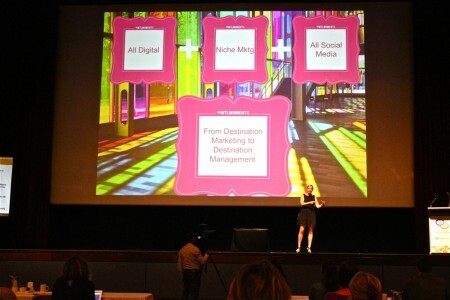 I attended over a dozen tourism conferences this year on four continents, including our own #SoMeT conferences. Looking back at the pictures I took and the presentations I’ve downloaded, there’s a common thread and it tells a compelling story about the future of the DMO. 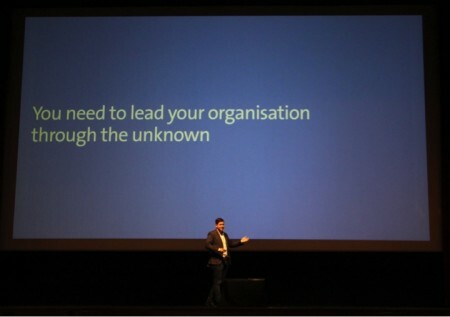 At #SoMeT13AU in Australia, William didn’t mind shaking things up with some provocative quotes including this one. We need to stop doing stuff that doesn’t work and start doing things that do work, and South African Tourism is blazing trails. What I’ve realized this past year is that we’ve passed the phase where people are skeptical or in denial. We have entered the phase where we are starting to ‘sort out‘ the model, as Clay Shirky calls it. The only things standing in the way are fear, lack of the correct skills and/or not knowing where to start. I really like this quote because it’s very relevant to what’s going on right now. I see it all around me. The DMOs with the biggest budgets aren’t necessarily the ones who are going to win. They can hide the fact they’re falling behind through big media buys, but there will be a tipping point soon where those who didn’t adapt will have to deal with massive change in a short period of time. And that’s going to hurt. Those who have transitioned and adapted strategically over a period of time will reap the rewards. By the way, the tipping point is when boards and/or politicians move away from judging activities based on how things look or make them feel, and instead look at the numbers that matter. I’ve started to see early indicators of this already. At #ENTER2013 in Innsbruck, Heidi Sørvig from Visit Sørlandet gave a very to the point presentation about how running a DMO in the 21st century really doesn’t have to be that complicated if you’re not afraid to lead, challenge the status quo and make changes. I’ve been a fan of Heidi’s strategy. It’s very innovative and practical. Her primary KPI is repeat visitation. Because if people come back, it means they like the experience. It also means they will probably recommend the destination to others. She also understands that it’s more efficient to train industry operators about how to manage and market a tourism business than pouring that money into traditional advertising. She has created a program for operators that’s probably the most extensive and sophisticated of any I’ve seen. And all on a small budget. Tourisme Montréal (a Think! client) has been one of the most innovative DMOs in the ‘big city’ category for years. With leaders like Emmanuelle, TM is not afraid to challenge the status quo, take risks and experiment. I admire her courage because she wants to do what’s right. At #SoMeT13AU, Emmanuelle shared how they’ve been transitioning from a Destination Marketing Organization to a Destination Management Organization over the last few years and how they have dealt with some of the obstacles. 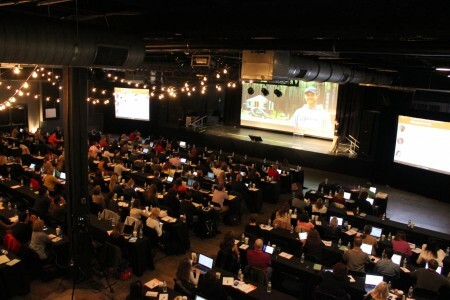 Accepting that a DMO doesn’t create a brand, but consumers do was one of the common threads at #SoMeT13US. This is a major shift for many marketers who are used to keeping a brand under tight control. At Tourisme Montréal, one of their guiding principles is to let go. Fred gave a passionate presentation in which he demonstrated how Tourisme Montréal is implementing programs and campaigns that deliver on this principle. 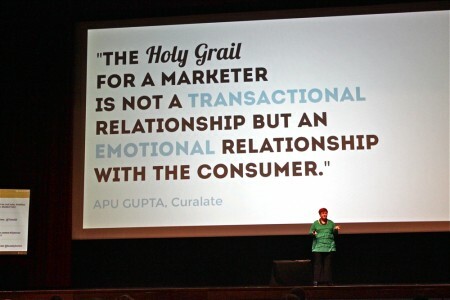 Donna shared this wise quote from Apu Gupta. What it means is that the transaction will happen as a result of an emotional relationship, and one that grows over a long period of time. It sits at the essence of most modern marketing philosophies including social media, content marketing and permission marketing. In the tourism industry, however, we often seem to be chasing the next “head in bed” or “bum in seat”. Tactics are focussed on the short-term, but we need to take a long-term view to build reputation and loyalty over time. Kuoni is a very large luxury travel brand. In many ways they are very traditional, but I’ve seen a few presentations from them now and the way they go about things will set them up perfectly for the future…if they get their online strategy right. 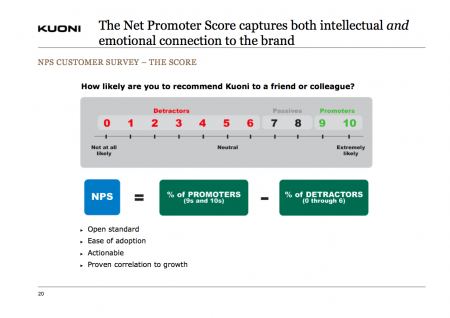 Kuoni places a lot of value in NPS (Nett Promotor Score) and they measure this at different stages of the customer journey. I like this slide because it’s almost identical to one I use. NPS is the best quantitive measure for the overall destination experience. The science behind NPS shows a correlation between NPS score, loyalty, referral and corporate growth. It’s also easy to do. Marc is one of the real thought leaders for service design. He co-authored a book called This is Service Design Thinking and now runs My Service Fellow and Smaply. 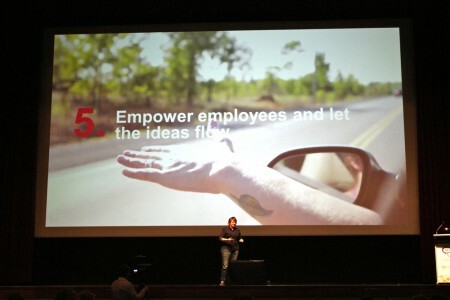 I’ve known him for a few years and he was kind enough to do a presentation about service design for the Think! 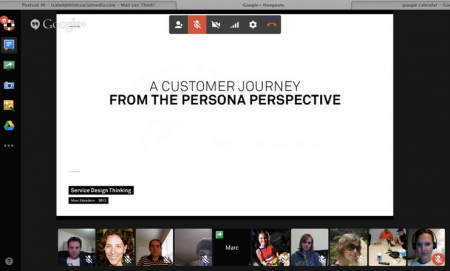 team over Google Hangout. Service Design is a methodology, process and a set of tools that will deliver on this objective, just like Information Architecture, Usability and Interaction Design for websites. Now that we need to build a brand on the ground, through stories people tell, a DMO needs to design the end-to-end destination experience. By using the dollars typically spent on advertising to work on designing the complete destination experience, people will have a better destination experience. As a result, your NPS score, the stories people tell, repeat visitation and referrals will go up. The Saskatchewan Roughriders (a Think! client) have a strong brand and very loyal following. Gregg explained at Host Saskatchewan that they way they’ve built their brand is primarily around experience. The result is incredible: 2/3rds of all merchandise sales in the Canadian Football League are for his team. 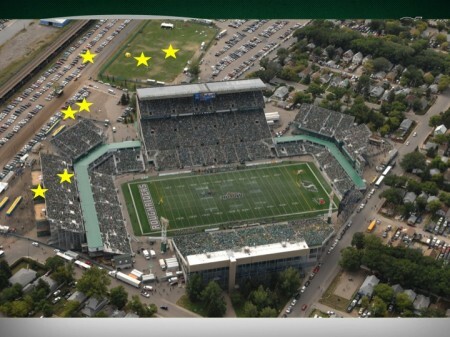 This slide maps some of the touch-points with their customers before the game even starts, from the parking attendant to the stadium host. Mapping the customer journey like this is part of the service design process. It’s the starting point to examine, benchmark and redesign critical touch points where required. 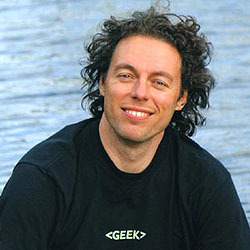 Jori operates an adventure tourism business in Saskatchewan, Canada. I loved his presentation during which he described the keys to his success. As a small business owner, he keeps things simple and focused. He does this by cleverly using technology, offering value while embodying the right corporate values and engaging staff (mostly guides) to empower them and make the experience awesome for the customer. The result is a runaway success. Jori understands the story his customers what to be part of, how to deliver it and and how to get the story told. If he misses the mark, he will adjust elements to fix the plot of the story. 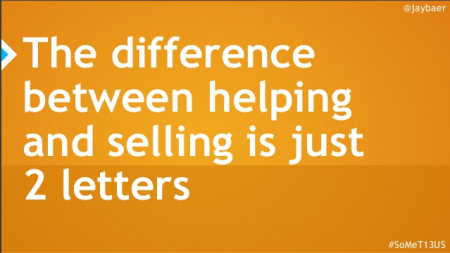 Jay Baer‘s message is all about creating value for the consumer. You can’t compete for attention anymore and the best way to gain trust is by adding true value to people’s life. He wrote a good book about it. It’s not hard to figure out how this applies to travel. Great customer service is key and visitor centres have traditionally facilitated a way for DMOs to deliver it. But customer service has moved outside of those four walls and a roof. Customer service now happens online, on Twitter, Facebook and message boards in all stages of the customer journey. 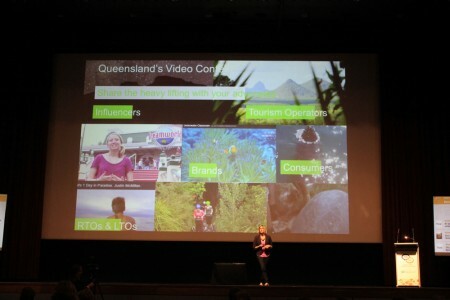 While presenting their online video content strategy for Tourism and Events Queensland at #SoMeT13AU, Sos explained how they have identified key groups of video content producers and described how they fit into their strategy. It’s important to recognize who the main groups of storytellers are and creating strategies that will help get the best stories out there. It’s also a great way to scale customer service. For example, TripAdvisor destination experts are doing customer service work for free. 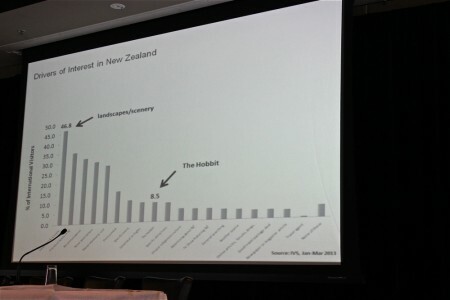 Catherine presented Tourism New Zealand’s three-year strategy to leverage the Hobbit movies as a niche marketing opportunity. Even though it’s very traditional (and I wish I could make it social at the core), it’s a perfect example of marketing to a niche audience. For example, Catherine shared the fact that while only 1% of visitors to the city list the Hobbit as a primary reason for a visit, but it still represents $33M. Focussing on a niche creates big opportunities because you can narrow your focus. Engaging a niche audience via their passions is much easier because it’s very relevant to them. And when you do it right, they will respond by sharing and influencing friends. Kate described the Canadian Tourism Commission’s social media journey. When a consumer is social, a brand needs to be social as well, and that will ultimately lead to a social business. A social business will be the end game – we call it a Level 5 DMO. Organizationally, it means letting of the control internally. The rate of change is only going to increase and as the role of the DMO changes and marketing becomes real-time, it’s really important to reduce bureaucracy and empower staff. It might sound scary but you’ll be surprised to what level people will rise to when they feel a sense of responsibility and empowerment. At #SoMeT13AU Jesse from Tourism Australia shared some of the strategies and approaches to managing the largest DMO Facebook page in the world. It’s very practical and another demonstration that it doesn’t have to be complicated. Just like Kate, Jessie also promoted the fact that it is the responsibility of the people within the organization to champion changes. For DMO leaders, my advice is to listen to the teams that are running your digital and social platforms. There is an incredible amount of talent out there and you need to use it. I’ve seen good people walk away out of frustration and that hurts all of us. Support your staff and take some risks. Let them create a plan. Park your skepticism, and invest in the future. Learn. And share it with your industry so they understand your new role better. Start the journey so you can manage it over time. For DMO staff, be an advocate. Find opportunities to create proof of concepts and promote them internally. Help your leaders and your industry understand what is the most efficient and effective way of destination management. Things won’t change by waiting for somebody up top to do the right thing, be pro-active and promote successes. This year was an exciting year. Many DMOs have done incredible things and I’ve learned so much. I’ve seen many more great presentations I didn’t include here. The future of the DMO is bright, as long as we let go of sacred cows, let go of fear, create a plan to move forward, learn and adjust as we go. Where to start? Benchmark your current activities, set clear objectives and create a strategy. At a minimum, create a plan for next year to start moving in the right direction. What’s your plan for 2014? By William Bakker | 12.08.13 | Permalink | Comment? The end of the year is approaching fast. And as you start to look towards the new year let me ask you what your plans are for your social media in 2014? Social Media has become an important part of the DMO marketing mix and it’s time to take a serious approach. At the moment there’s a lot of good work happening but most of it is approached in an ad-hoc or intuitive way. In order to bring your marketing to the next level it’s time to create a plan. We see the best results from clients who have spent the time to create a plan for social media activities and with 2014 approaching fast, why not create one now? At the bare minimum, set specific goals for 2014 and assign some budget and human resources against it. Then identify specific activities throughout the year to achieve those. Some will be year-round, other will be time-based (campaigns). Set specific targets for each so you can track progress. Then evaluate your progress every quarter and make adjustments where needed. Even with a simple plan, you’ll find you will spend your energy much more efficient because you’re focussed. As an agency we appreciate it as well because we can help you build the plan and plan our activities throughout the year instead of focussing on one-off projects. Just drop us a note and we’ll get you started. Building a destination brand is done primarily through the stories people tell each other. And social media has only accelerated that process. Getting more of the right stories told is a massive opportunity but how do you go about it? Here’s a 5 step strategy for this. A destination is the stage where memories are made and stories are created. People ignore or forget the ordinary and remember and share what’s remarkable. These remarkable experiences often turn into the primary motivators for others to visit a place. In order to get more stories told in social media, you need to make sure things are worth talking about. 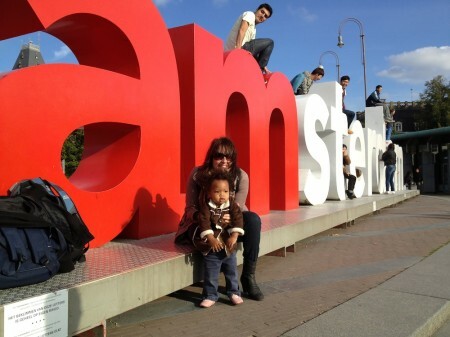 The IAmsterdam sign in Amsterdam (above) is always surrounded by tourists taking photos. Not only is it a cool piece of art, it’s also the perfect way to tell your (Facebook/Instagram/etc) friends where you are. For a tourism business it’s important to build in moments that motivate people to share in the overall experience. For a DMO it’s important to increase the number of things worth talking about overall. Educating your operators about this principle is the low hanging fruit. Every tourism business should have at least one reason for people to talk about them. Often it’s just a matter of making a few tweaks to get people talking. Getting involved in city planning might be more difficult but can pay-off with massive dividend. When there’s something worth sharing, people need to be able to share it right away. For international visitors, data roaming is often an obstacle and the availability of free Wifi will increase social sharing. It’s not just the responsibility of operators. Viewpoints, beaches, mountaintops, buildings of great architecture typically don’t have a tourism operator associated and Wifi is nowhere to be found. This is where the DMO can step in. Taiwan gets it, they offer free nationwide Wifi to tourists. But there are other obstacles. Some businesses don’t allow pictures to be taken while others don’t have the proper lighting to make photos or to make them look good. It’s a missed opportunity, you have to give people the opportunity to share, even if it’s in a limited capacity. People will share an experience when they find it remarkable. For people on the fence it’s easy to pull them over the line by encouraging them. This can be achieved by things from signage to incentives. Disney identifies places in their theme parks with photo opp signs. Some DMO’s are starting to do the same. We worked with a ski resort last year to do put signage up to encourage sharing combined with and a contest for the best photos shared. At an operator level it’s often a matter of reminding and asking people. Remind people on checkout to give a review on Tripadvisor for example, or follow up with an email. Others take it a step further. When I was in Wollongong, Australia, the Skydiving operator filmed and photographed the experience and gave me a link where I could download the images with an easy way to share them through my social channels. When people share stories, it’s important to find them. Social Media is like a world-wide, real-time, always-on focus group. You’re crazy if you don’t take advantage of it. 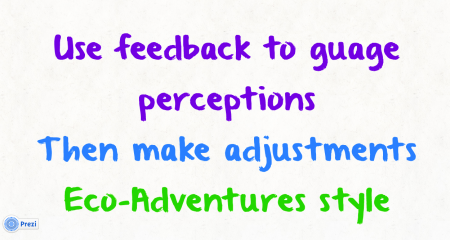 You need to find them the relevant stories about your destination, good or bad. A lot of other opportunities and insights can be gained from the massive amount of stories out there. Brands like KLM, Gatorade, Nascar and many others have dedicated social media team that monitor social media for a variety of purposes. These programs separates signal from noise by curating the content and processing it for specific purposes. Some data might need to actioned on while other data serves specific research purposes. Some of the best stories told in social media are worth incorporating in your own marketing. People share stories with great emotional appeal and the quality, creativity and authenticity often rivals what a DMO and their agencies produce. Use the best content you find to enhance your own activities of amplify them through your own channels. Visit Britain started sourcing the majority of the photos on its website from Flickr back in 2009. Tourism Australia only posts photos on Facebook submitted to them by their community. Many DMOs find the best photos on Instagram and reshare them while Pinterest is probably the best example of content curation with the best photos people find online. But why stop there? You might want to give some quality content even more exposure. You can use some SEM budget to amplify a great blog post from an influencer for example. Some amplification can go even further. The Canadian Tourism Commission turned some of the best YouTube videos they found about Canada into TV commercials and recently crowd-sourced another. It doesn’t matter who created the story or where it’s located. What matters is that it moves a person down the funnel. Social Media will identify customer service challenges and opportunities. DMOs are already in the customer service business but have often limited themselves to a box called a visitor centre. Step outside the box and start assisting visitors in real time by responding to people in social media. Customer service challenges can be resolved quickly before they turn into negative stories. In the meantime, the overall visitor experience will benefit from assisting travellers through social media. KLM will respond to any social media question within an hour. Most tourism operators don’t have the luxury to set-up these kind of services but the DMO can fulfill that role on behalf of their industry. Listening can also help to find information about a destination on the internet that’s incorrect (yes, there is incorrect information on the interwebs). This information could be viewed by many potential visitors who could make the wrong decision as a result. Often it’s just a matter of contacting the owner of the source to correct the error. Start by asking nicely! If something slips through the cracks and negative stories start to emerge it’s important to mitigate these as soon as possible. There are also specific events that could cause a social media crisis. Think about a natural disaster, a call for a boycott or an influencer will a horrible experience. Being prepared and having a social media response plan in place will streamline communication before things escalate far and wide and cause considerable damage. Don’t rely on old corporate communication strategies, they don’t apply to social media. Just ask United. People will take pictures of things they find remarkable. And when they put themselves in the photo it’s even more remarkable. The things people find remarkable might surprise you. Insights gained from a curation program can provide you with all kinds of new marketing ideas or even identify potential target audiences. You will also identify the challenges visitors might have with the destination experience overall, sometimes in places you might not expect. Addressing these challenges in a fundamental way through service design will allow you to create a more favourable perception of the destination overall. You can measure these things over time, segment them by audience, experience and other parameters. It’s a massive opportunity and part of the future of destination marketing. Destination Marketing is storytelling. And by now every DMO is generating content and distributing it through their own channels. Content is shared, people engaged, fans, followers and engagement is measured and reported. Social Media is firmly established as an important channel. But if you want to start thinking like a level 4 DMO, one of the first things to do is look beyond storytelling through your own channels. 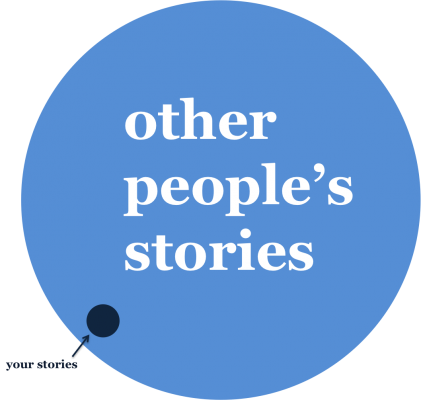 The stories people share with each other in their own networks (often private and invisible to marketers) is more credible and trusted than any story a DMO creates. At #SoMeT13AU, Carl McCarthy from Facebook shared that over 70% of travellers update their status and/or share photos while on holiday. Let’s look at the Capilano Suspension Bridge, a populair tourism attraction in Vancouver. 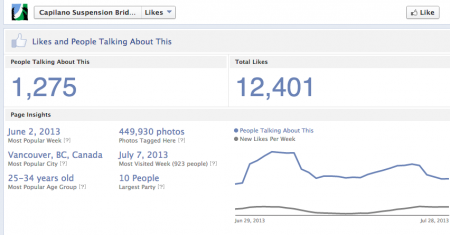 The public stats for their Facebook page show a respectable 12,401 fans with 1,275 people talking. But look at an often overlooked little statistic; 449,930 photos have been tagged with this tourism experience. Let’s look at ten of the more populair attractions in Vancouver (selected by myself from memory). Collectively, these pages have 146,819 fans. More than 3x the fans of Tourism Vancouver’s page. The total number of photos shared is almost 2 Million! If we consider that the average Facebook user has 150+ friends it means that those 2 million photos probably reached tens of millions of people. And those are just photos of attractions where people geotagged the photo. 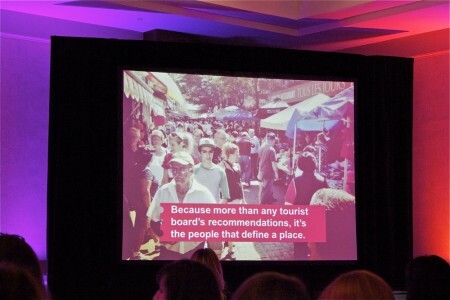 The true number of tourism related photos shared online for Vancouver is exponentially larger. That’s the real Facebook marketing. There’s also plenty of research that demonstrates the effect of somebody posting a Facebook picture has on their network for example. Anywhere from 20% to 52% of consumers have taken a trip to a destination as a direct result of seeing a photo posted by a friend. 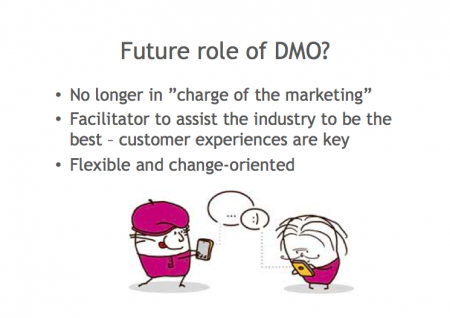 The implication is that a DMO marketer needs to look beyond their own channels. Most of the conversation is happening elsewhere and often invisible. But as you can see in my examples above, that doesn’t mean you can’t measure it. The success of growing tourism in your destination goes beyond the activity the DMO manages. It’s a collective effort. First thing to do is collaborate with your operators to make sure they make the most out of their own social channels. Second is to actively grow the number of visitors sharing their experiences through their social channels. Through encouragement but also by enabling sharing. Third, and this is where we get into the future of destination marketing, by actively managing your destination to give visitors more reasons to share their experiences and mitigate any negative stories.